Once again LEGO mini-figures have gotten a makeover in the name of commerce – this time as the bad boys (and one girl) of dive bar culture. Conceived by Grey, a Spanish ad agency (hence the spelling) the tough-as-nails LEGO characters are heavily tattooed to showcase the details that can be acquired when using the new Pilot Extrafine pen. These are the minifigs other brick toys fear encountering in a dark LEGOLAND alley. Once again LEGO mini-figures have gotten a makeover in the name of commerce - this time as the bad boys (and one girl) of dive bar culture. 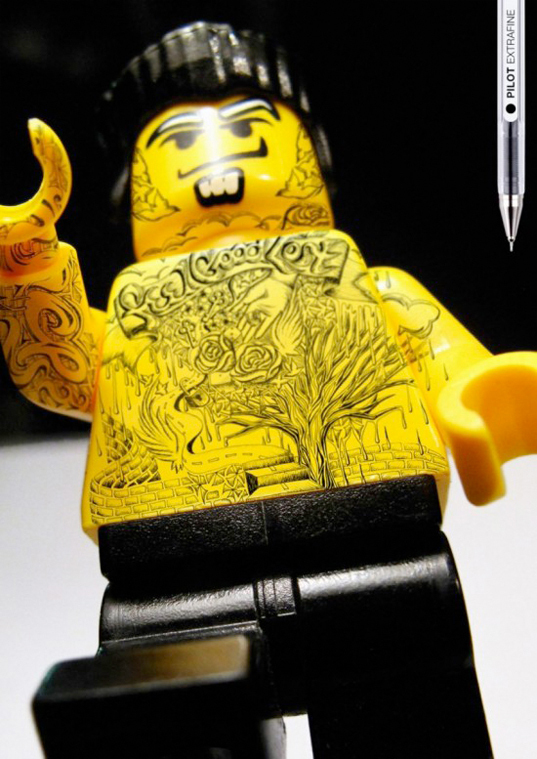 Conceived by Grey, a Spanish ad agency (hence the spelling) the tough-as-nails LEGO characters are heavily tattooed to showcase the details that can be acquired when using the new Pilot Extrafine pen. These are the minifigs other brick toys fear encountering in a dark LEGOLAND alley.